We are pleased to announce that Jannie has found her forever home. Our thanks to her new human pack for sharing their home. Sweet, gentle, playful Jannie is a three year old female who came from a small private rescue who doesn’t usually take big dogs. The lady had tried to place her several times but the situation was unsatisfactory in each case. Finally, someone suggested she call us. Transport in two stages was set up. Jannie arrived and immediately asked to be petted. She was somewhat unsure but slurped down a half pail of water, drooling most of that onto me! Just a tad anxious was the girl, after going from a neighbour’s house to the rescuer, into the vehicle, stop, into another vehicle and finally here where she saw other big white dogs for the first time. After some smelly sardines and something to calm her down, she started to eat kibble. When she saw the chicken portions of the other dogs, she asked for some as well. Although not undernourished, she is slim, though I believe she will always be that, if she has exercise and outdoors to run. She has accepted to walk more quietly on leash as well, something she didn’t like at first. Freed up from her pen in the morning, she curtsies and invites play. She put the young male who wanted to play over and under in his place quite smartly. She likes to stay outdoors in the pen next to her male companion. The ear infection has cleared up nicely and the drooling is diminishing as she has found a comfort level and a routine. Stress drooling still occurs but a return to her routine diminishes it rapidly. Petting and belly rubs help as well! She loves that! The raw meat and grain free kibble seems to have been a factor in the disappearance of the supposed allergies as well. Jannie does have tablets of clomicam yet, to allow for cntinues control of the anxiety symptoms. Over all, Jannie is a very pleasant companion who likes to live outside quietly with or without another dog. For the first few days here, I thought she had no voice, she’s so quiet, that is until there were unwlcome visitors in the field two fields over. When the male spotted them, she did too and sang the backup trill to his baritone. She has a lovely sounding voice, somewhat muted. Jannie is not asking for much: just a back yard, a large dog house, decent food and cool water and an appropriate job guarding her yard and her human’s people, even the cat. That was a very interesting encounter with the kennel’s chief mouse manager! Wonderrful dogs these Pyrs are. 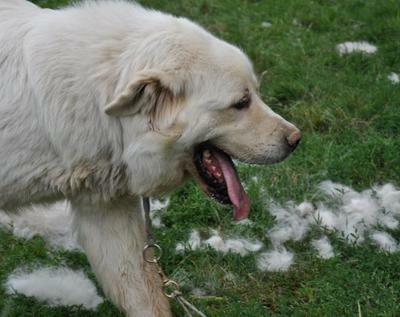 Jannie looks to be a wonderful dog with a lot of life yet to be uncovered. 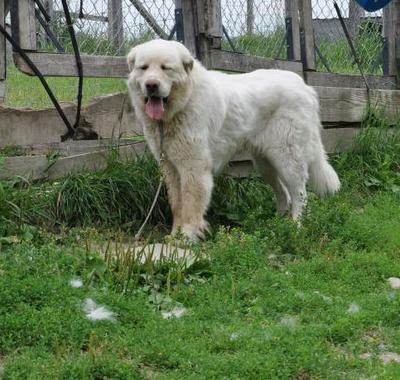 I check your site daily to sere about new pyrs and updates on your resident pyrs. I submitted an application for adoption but have not yet heard anything. 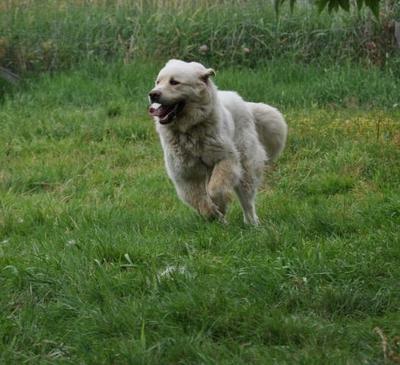 I hope to be able to own one of these wonderful dogs soon to be a playmate for my male pyr X golden lab. 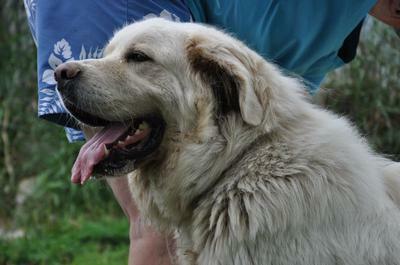 We love him to pieces and would love to rescue a pyr in need to a great and loving home. Thank you and keep up the wonderful work this organization does to help these magnificent creatures.